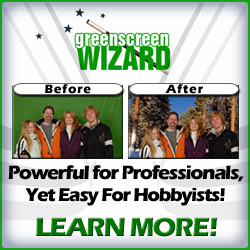 If you're a photographer who wants more background options for your subjects, then take a look at Green Screen Wizard. It's green screen photography software that allows you to replace a green background with another image - almost any image! Most of us understand the concept from TV weather reporters who stand in front of a green screen in the studio, but the TV viewers see computer map behind the reporter. No need to drive around the world looking for the right background. Simply place a green screen behind your subject, take your pictures, and import your photos into the Green Screen Wizard. In just a few clicks, you can change out the background with any image of your choice. It doesn't have to be any special image. Actual photos, surrealistic images, or even royalty-free images from Dreamstime will work perfectly! Are you shooting a wedding in the city, but want a country background? Need a solar system background for a space themed high school prom? Tired of boring family pictures? Spice them up! This green screen photography software is easy to use and can give you options as a photographer you never had before! No other software of plugin is needed! 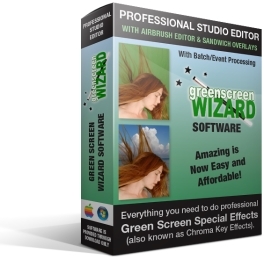 Green Screen Wizard is a complete green screen photography software solution. Simply follow the lighting and photo set up for best results. Need A Website For Your Photography? Take your photography to a whole new level by changing out the backgrounds behind your subjects with Green Screen Wizard. Download the free demo now and try it before you buy it! Want more leads and customers for your photography? Click Here to get listed with Thumbtack! Get leads, bid on projects and grown your photography business. combine the above finish picture with the frame of his choice. 6. when he has found his frame he ad it to cart. We will order and pay the software with exclusive rights to use worldwide. You are the partner for our company?